Helen Dunmore's latest novel Exposure is set in 1960, when Britain was in the grip of the Cold War and a few years after the defection of Burgess and Maclean. Simon Callington, a mid-ranking civil servant at the Admiralty who lives uneventfully with his wife and three children in suburban Muswell Hill, receives a late-night phone call from a colleague and former friend, Giles Holloway. Giles has had a serious accident and been taken to hospital, but there's something wants Simon to do: to go to his flat, collect a file that Giles had taken home from work, and return it to the office before morning. This simple favour triggers a ripple effect that has devastating consequences for Giles, Simon, Simon's wife Lily and their three children, gradually exposing a web of deception that extends beyond secrets of state and into the backgrounds of everyone concerned. This book isn't, as such, a spy thriller. It's something quieter and more reflective, more personal. The technicalities of spying and the nature of the material in the secret file are also of little importance, and the identity of those who colluding in handing secrets to the Soviets is revealed almost immediately. Instead, the book focuses on the personal implications of what becomes a high-profile scandal. Giles, Simon and Lily all have more to hide than their involvement in the espionage plot, and each of them is, to some degree, estranged from their own past, whilst still shaped and defined by it. 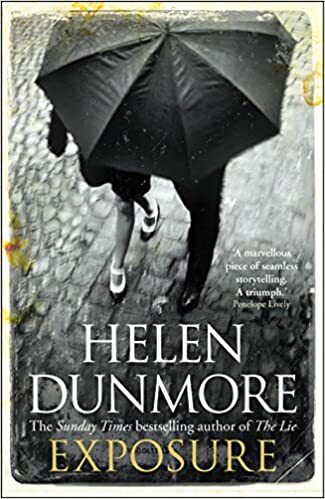 Helen Dunmore is not only a deeply perceptive writer with a remarkable gift for character - Lily, with her steely determination and innate loyalty to those she loves, is particularly well-drawn - but is also exceptionally skilled at evoking history and place. Every period detail is perfect; each mundane detail of suburban life and the social norms of the day is acutely well-chosen. It's impossible to read Exposure without feeling utterly immersed in the setting. While it's often observed in the novel that 'real spies are dull as ditchwater' rather than 'cloak and dagger types', the characters are still in enough genuine jeopardy to punctuate their reflections with moments of grim tension. Giles, Simon and Lily are really mere pawns in a much bigger and more sinister game, and when one of the major players decides to pay them individual visits, things take a dark turn. Exposure is a beautifully-crafted and deeply absorbing novel, and I'd really struggle to find any fault any fault with it. Exposure is published in the UK on 28 January. My thanks to the publisher for providing me with a copy via NetGalley in exchange for an honest review.